From the 1 st of October 2017 the first year of PoSIG studies has officially started. 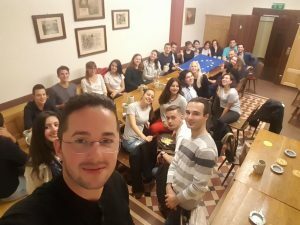 Students from different countries of the Balkans are now accommodated in Salzburg, pursuing their first year of studies at PLUS (Paris Lodron University of Salzburg). The first ten PoSIGers are now familiar with the PLUS facilities and are a really important value for the international group of students. Socializing is a really important aspect regarding the student life and PoSIGers are giving their best towards this. Below you can find some of their thoughts regarding the programme and the student life so far. PoSIG is a program that develops the student not only academically but also culturally. First, you have the opportunity to develop your knowledge in two areas of political science, which is important to consolidate your notions in different aspects. The curriculum and the academic staff imply the proper training to not only learn but also even develop critical thinking. Second, you get in touch with people from different cultures and this makes you see the world in different aspects and also gives you the possibility to collaborate on different research topics. Finding the common language over problems I think makes the world a better place to live. PoSIG has so far provided me with some very powerful tools that will help me to map out my future career. I am finding the courses to be very interesting and challenging at the same time. I am very impressed by the outstanding job of the lecturers and the staff’s willingness to help. Other than the academic perspective, it is such an amazing opportunity to get to know new people, from all over the world. The joint Master in Political Sciences – Integration and Governance (#PoSIG) is the result of EUROPS project that was financed by the Erasmus+ Program of the European Union between 2015-2017. Most of the students have received Erasmus+ Credit Mobility grants.